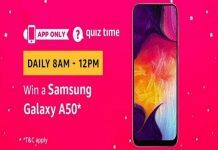 Amazon Quiz Time | Win Rs 5,000* (10 winners). 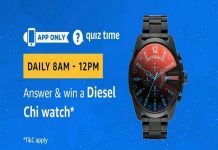 Answers all the 5 Questions correctly, If you are lucky then you will win Rs 5,000 as Amazon Pay Balance. This is Amazon App only contest. 5. Done. Congratulations !! 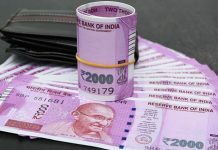 You are eligible to win Rs 5,000 Pay Balance. Note:You need to answer all 5 questions correctly for eligible to win Rs 5,000 as Amazon Pay Balance. Question 1. Which Indian state is the first in the country to have 4 international airports? Question 2. Ophidiophobia is the fear of ______. Question 3. Who is the coach of the Indian women’s cricket team? Question 4. A group of crows is called a ‘murder’. What is a group of owls called? Question 5. In the final season of Game of Thrones, Daenerys Targaryen is battling for the Iron Throne. What was her father’s name, who once ruled from the same throne? Once you have signed-in to the Amazon.in App, you can participate by navigating to the page where 10 (five) questions will be posted during the entire Contest Period. The draw of lots will be carried out during the Contest Period for the questions and a total of 10 participants will be selected as winners by a random draw of lots. 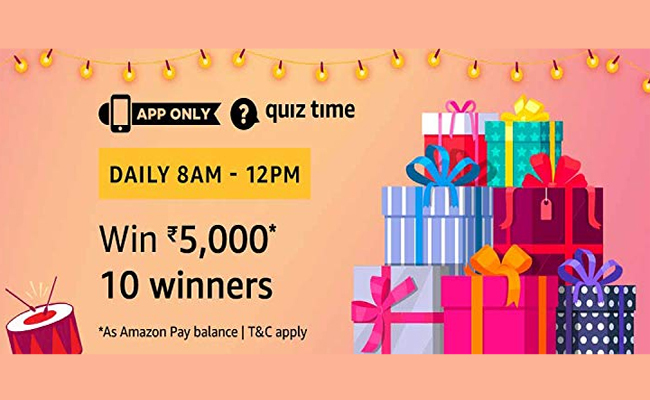 The declared winner(s) will be eligible for winning Rs 5,000 Amazon Pay balance (hereinafter referred to as “Prize(s)”), which will reflect in the winner’s Amazon.in account as Amazon Pay Balance. Today’s Answer are 100% Correct update the Question with Answers daily . The answer to the last question is wrong.. Question 5. Who was the first Indian from the film industry to win an Oscar award? Sir i m not getting whatsapp broadcast….